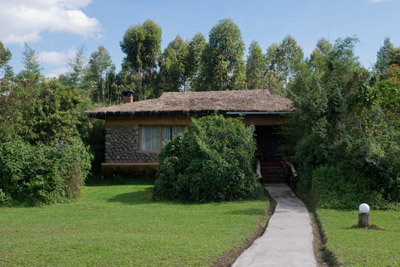 Friday 31 May We had an 8pm flight from Heathrow to Kigali with a short stop in Nairobi. Saturday 1 June As we approached Nairobi the sky had started to turn a deep red and we could see the huge silhouette of Mount Kenya to the East. After a two hour wait in Nairobi it was only a further 90 minutes to Kigali in Rwanda. We arrived early Saturday morning. Our guide Hussain was waiting for us at the airport. 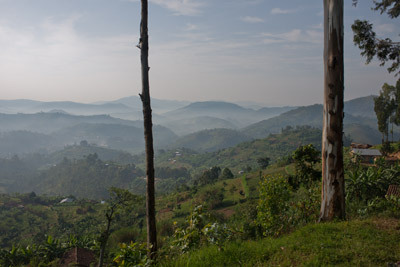 The country is known as “The land of a thousand hills” and it didn't take long to see why. As we left the airport and travelled through Kigali we could see the city sprawling out over the sides of the surrounding hills. It was about 2 and a half hours drive to the Volcanoes National Park and I couldn't help but notice the quality of the roads - not a pothole in sight. 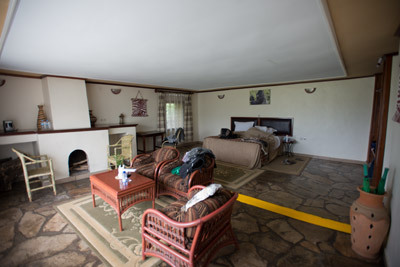 We spent our first four nights at The Gorilla Mountain View Lodge in Ruhengeri which was just a few kilometres from the borders with Uganda and DR Congo. There was a heavy downpour of rain as we neared the lodge and the gutters at the sides of the roads became deep with fast flowing water. The noise of the rain as it bounced off the lodge roof was almost deafening. After checking into our room we almost immediately sat down for lunch. The lodge had open fires burning in the lounge and bar areas which was a great idea but they belched out smoke which at times made the room rather unbearable. The bed in our room was probably the firmest I'd ever felt. It was basically like sleeping on the floor but I found it to be surprisingly comfortable! After a much needed nap it was time for dinner. The food at the lodge was basic, but well cooked. Breakfast, lunch and dinner was in the form of a plentiful buffet with plenty of veggie options plus a couple of meat dishes. Each evening a fire was lit in the room and we were provided with hot water bottles – just what we needed in the cold evenings. Sunday 2 June A 5:30am wake-up, followed by a quick breakfast and we were ready to go by 6:45. 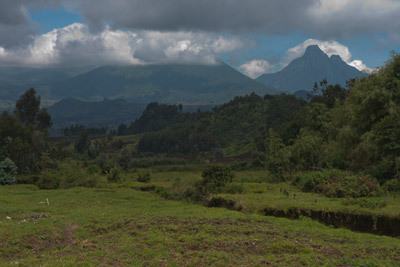 It was just a short drive from our lodge to the Volcanoes National Park visitor's centre. We were provided with tea and coffee while a group of locals performed a dance. We were then introduced to the two trackers that would be taking us on the Golden Monkeys hike. It was just a short drive from the visitor's centre to the beginning of the hike. 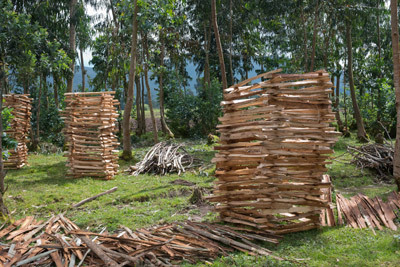 A group of locals were waiting for us – many of them would have previously been poachers but were now acting as porters. For $10 a day they carried our bags and made the longer hikes a fair bit easier (money well spent to keep them from poaching!). We started out with a short walk across farm land. It was kind of nice to see familiar rows of runner beans and potatoes stretching out across the fields. We reached a stone wall that had been built to define the edge of the park (to stop locals farming more land and to keep the water buffalo inside the park). 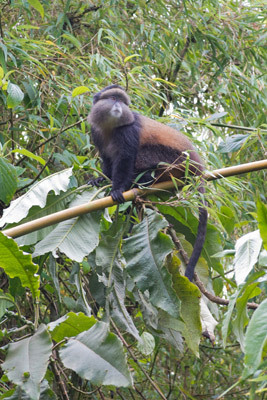 It took a little while for the trackers to locate the troop of Golden Monkeys but they were not very far inside the park boundary. 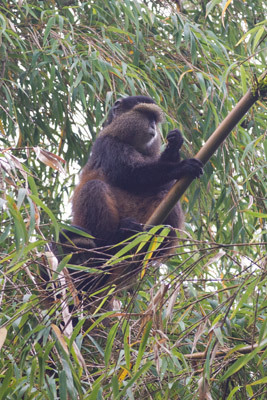 The Golden Monkeys spent much of their time in the tops of the trees which made it a little difficult to see them properly. Tammay was quite keen to visit Lake Burera and Lake Ruhondo during the afternoon but an hour long drive put me off. Instead we ended up staying at the lodge. In hindsight I wished we had done a little more while we had been in the area such as these lakes and a set of caves I saw sign posted nearby. Monday 3 June Another 5:30am wake up call got us going for our first gorilla hike. In all there are 10 gorilla families allocated to tourist groups plus a further 9 families dedicated to scientific research. 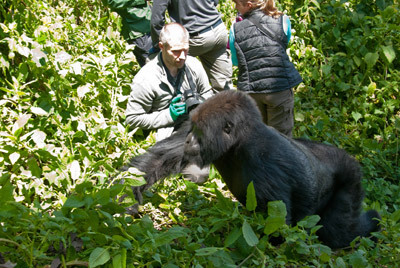 We had read the overviews of each family and picked 2 groups we particularly wanted to see; Amahoro (really active group with 3 silverbacks, 2 black backs and a 3 month old newborn) and Agaysha (a relatively large group with around 26 individuals but only one silverback). As only 8 tourists can visit a particular family each day, our guide had to arrange for us to be part of the specific party. 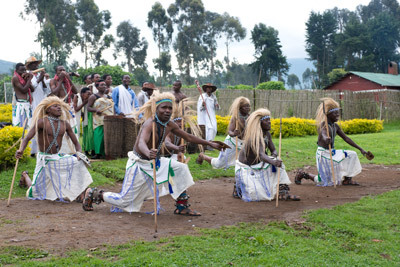 Thankfully our guide Hussain got us into the party visiting Amahoro. That said, I'm not sure how many people actually state a preference to see a specific gorilla family, and when they do it's likely to simply be a request for a short hike. 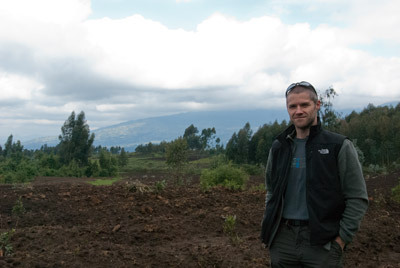 As we hiked up the mountain towards the Amahoro family our guides communicated with the trackers. 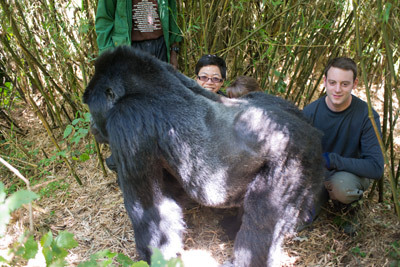 Unfortunately the gorillas continued to move and as we tried to reach them, they double-backed on us. In the end our guides decided we should trek directly up the steep mountain, hacking a path through the thick undergrowth as we moved. 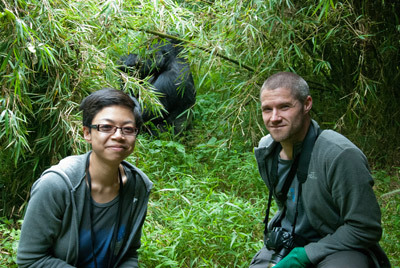 It took us almost four hours to reach the gorillas but it was well worth it when we finally did. As we approached the group we started to hear them. 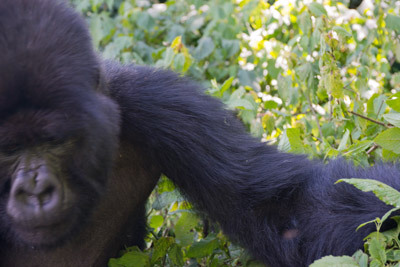 I squeezed through the undergrowth and was confronted with two adult gorillas sitting in the grass in front of me. I crouched down and stayed back giving the gorillas plenty of room. One of the silverbacks got up and moved up the slope directly towards me. As he walked past he gave me a friendly slap across the top of my leg. As I was taking a blurry photo of the gorilla passing by, Tammay was taking photos of me. During the hike we started chatting to Robert and Abby, a couple from Yorkshire who were also staying at our lodge. During the hour we spend with the family I was hit a total of three times - one further punch to my leg and also a proper 'Thai kick-boxing' move to my knee. I don't know why they chose to pay me this attention and neither did our guides who seemed worryingly surprised! I wonder if it was anything to do with the silver fleece jacket I was wearing! 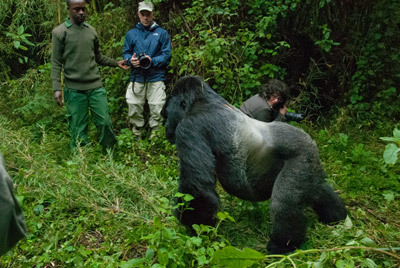 Tammay also found herself 'trapped' against a tree by this silverback as he paused on his way passed. There were a couple of juveniles in the group who were 'showing off', beating their chests and playing around. This is a short video of them playing. Thankfully it only took us around an hour to get back to the vehicle. 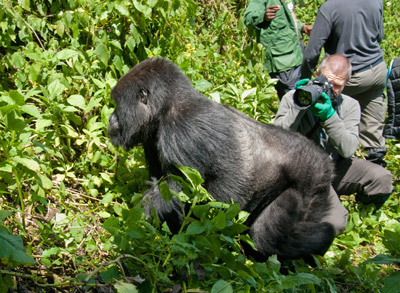 Permits to view the gorillas now cost $750 per person, per day. It's a huge amount of money but it does seem to be benefiting the area. We were told that 20% of this money goes directly into the community, funding things like hospitals, schools and water treatment plants. As we drove between our hotel and the visitor's centre young children at the sides of the road waved at us excitedly. It felt like these children were being taught to understand how their communities were benefiting from tourism. Our successful viewing of the Amahoro group meant we were eligible to return to a small 'visitors centre' and receive certificates. We also bought some small gorilla wood carvings from one of the curio shops. By the time we got back to the lodge we were exhausted! We made time for a quick lunch and then it was time for a nap! After dinner we chatted to Robert and Abbey. We also met an Australian couple who were spending their retirement travelling the world. Tuesday 4 June Following the same schedule as the previous day, we requested and were allocated the Agaysha group. 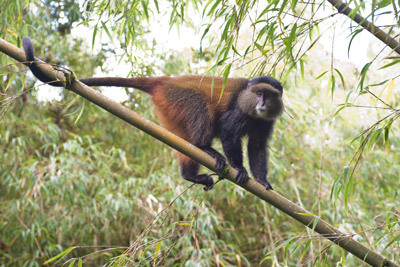 It was a much shorter hike – the group were located very close to the golden monkeys, just inside the perimeter wall. Although this group was quite a bit larger than Amahoro we only saw a small number of individuals. The group were also far less active, but 3 of the juveniles were very playful. We returned to the visitors centre and received a second certificate. We also bought a traditional African mask for what we considered a relatively reasonably $30! Wednesday 5 June A day of travel. Hussain drove us back to Kigali for our flight to Nairobi. We bumped into Robert and Abby and chatted while we waited. At Nairobi changed planes for an onward flight to Kilimanjaro. We decided to cough up the $60 for entry into the 'First Class' lounge, but when we saw the facilities to be anything but first class we tried our luck at the BA lounge – much more comfortable and not a soul in sight. An expected 4 hour layover eventually turned into 6 when our flight was delayed. Albeit a little late, we finally landed in Tanzania.